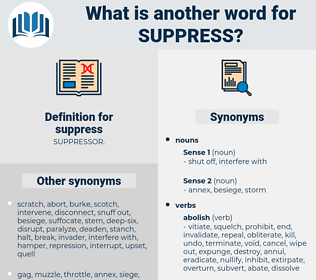 What is another word for suppress? Strikes, punish, remove, removes, deter. stopped, Prevented, Eliminated, Rescinded, halted, Abolished, foiled, controlled, removed, remove. 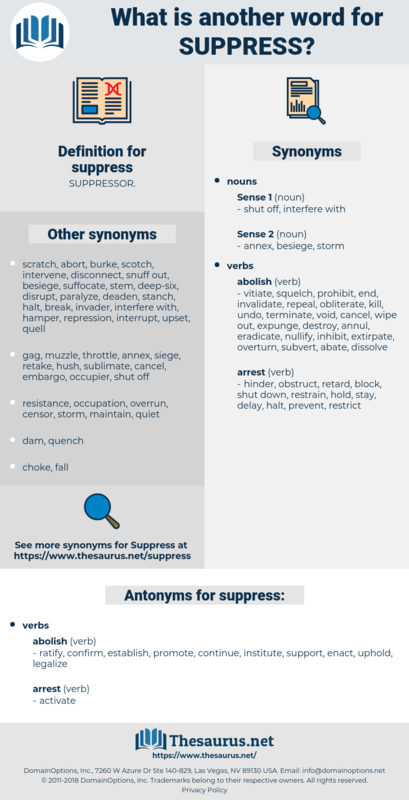 restrain, stop, prevent, extinguish, interdict, suffocate, curtail, depress, smother, quash, subdue, halt, discourage, criminalize, dampen, inhibit, restrict, neutralize, penalize, douse, discontinue, address, cease, terminate, disrupt, stem, dismantle, reduce, destroy, strangle, contain, nip, cancel, redress, impede, thwart, proscribe, scrap, reverse, Reversing, outlaw, constrain, punish, forestall, respond, uproot, silence, press, preclude, suspend, banish, obstruct, neutralise, overturn, dispel, pressure, dispense, hinder, lift, undermine, pre-empt, conceal, withdraw, dispose, prosecute, nullify, waive, negate, avert, disappear, end, rein, remove, rescind, crack, hide, choke, abrogate, defuse, exclude, hamper, revoke, omit, block, deter. ratify, confirm, establish, promote, continue, institute, support, enact, uphold, legalize. build up, yield, light, give in, open, start, compliment, surrender, praise. cherish, aid, spread, introduce, restore, assist, present, abet, narrate, release, foment, reinstate, repair, authorize, divulge, describe, revive, renew, sustain, loose, whip, back, express, boost, uncloak, display, debunk, recite, spill, blab, air, rehearse, incite, stir, recount, advance, further, set up, illuminate, forward, unmask, show up, bare, clarify, disclose, provoke, prop up, expose, vent, unveil, help, show, instigate, relate. He managed to suppress the threatened explosion, however, and burst into a loud roar of laughter. So far I have given my letters to my maid, and I cannot think of any reason which could induce her to be wicked enough to destroy or suppress them.